One could be forgiven for mistaking Sausalito for a Mediterranean fishing village; the ambience of a vacation resort, the quaint boutiques, upscale art galleries, scenic waterfront walk, and yacht-filled marinas give it that vibe. Sausalito has been a favorite retreat of San Franciscans looking to “get away” since the advent of passenger boat service in the mid-1800s. Arriving by ferry, visitors will see elegant houses tucked into hillsides. The ride across the bay offers a spectacular approach to Sausalito, with views of the Golden Gate Bridge along the way. Sheltered by the Marin Headlands that lie just beyond the bridge, Sausalito is usually warmer than the city but is often breezy in the early evening when the fog rolls in. The Bridgeway Promenade is not specifically a boardwalk, but a concrete road that runs through the town. Anyone who spends time in the community will most likely travel Bridgeway Promenade by car, but because of all it has to offer, it’s nice to take a day and walk or bike in order to check out all its many amenities. The boardwalk at the southern end of the Bridgeway Promenade, near the spot in Old Town where Sausalito was founded as a Mexican Rancho in 1838. The boardwalk north of the Sausalito Ferry pier, spanning the border between Downtown Sausalito and the Caledonia Street area. It has been said that Bridgeway Promenade offers some of the best views in the Bay Area. In fact, if you Google “Sausalito” most of the “big view” photos you’ll see were taken from the Bridgeway Promenade, which runs along the water from Richardson Street to Princess Street. It’s certainly a great place to view the water and the San Francisco skyline. Some of the most beautiful views of the Bay can be found while enjoying tasty dishes at one of the many restaurants located along the Promenade. Whether you’re looking for fresh seafood, Italian cuisine, causal eats, or simply a wine tasting, you will find something that hits the spot. Shopping is also plentiful along Bridgeway Promenade, including many locally owned boutiques and art galleries. One popular shopping spot – “The South Shops” as locals call it – is a great place to find clothing, holiday decor, shoes, toys and much more. Keep heading north on Bridgeway to shop for flowers, sporting goods, jewelry and other fun items. After spending the day shopping, pamper yourself at one of the many spas and salons along the boardwalk. Then, of course, there is Sausalito’s beloved Sea Lion Statue. Located at approximately 400 Bridgeway and just south of The Trident Restaurant, this world-famous statue is the work of sculptor Al Syrian. Blink and you'll miss the small staircase that leads to a lower, more rugged sidewalk. The area is easier to access at low tide. 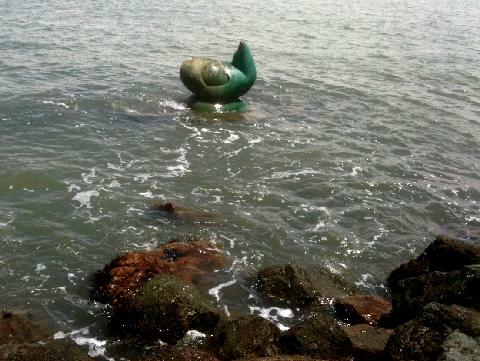 On windy days at high tide, the statue may be a little harder to locate. The railroad to connect to the Ferries from San Francisco spurred the growth of “New Town” along Caledonia Street, with the Promenade lying at the base of “The Hill” as the route north from Old Town, the original neighborhood of Sausalito. The center area of the Promenade, where the Sea Lion Statue now stands, was at one time called Hearst Point, since William Randolph Hearst had built a mansion on the hill above it. Princess Street, which divides the Bridgeway Promenade from Downtown Sausalito and the Ferry pier, was originally named after the ferry steamer “Princess”, which local businessmen operated from a pier near the foot of Princess Street starting in the 1860s. From the beginnings of Sausalito until the opening of the Golden Gate Bridge in 1937, the major thoroughfare was called Water Street. The name was changed to Bridgeway to reflect the fact that it connected the town to the Golden Gate Bridge. Although this area represents what was traditionally a “promenade”, a popular term in the 19th and 20th centuries for a wide shoreline walkway, the term “Bridgeway Promenade” does not date back to the early history of Sausalito. The name was created in 2008 to distinguish between this part of the downtown area and the very different area north of Princess Street, and it’s gradually come into use around the City. If you’re planning a trip to the Bay Area in the future, why not put the Sausalito Boardwalk on your to-do list while you’re here? If you’re a local, make a quick getaway to this area gem as soon as possible. It’s the perfect place for a day trip, or even a weekend stay! Contact Us for further info about san francisco and marin real estate.